Each time I have visited the Bahamas I have been transformed by the love shown by the Bahamian people. This year I decided to sign up once again to join 45 other youth and adults on a mission trip to Eleuthera, Bahamas. Having been to the Bahamas two times before, I had an idea of what to expect. I knew I would spend the week in community with others, be surrounded by beautiful oceans and eat conch salad. However, I was once again surprised by the power of community in the Bahamian culture. I spent much of the trip reflecting on how I personally have changed in the past three years since returning to the island and the power “island time” has on creating deep meaningful connections with strangers. I saw the beauty of God in the surrounding landscape and the people I met. 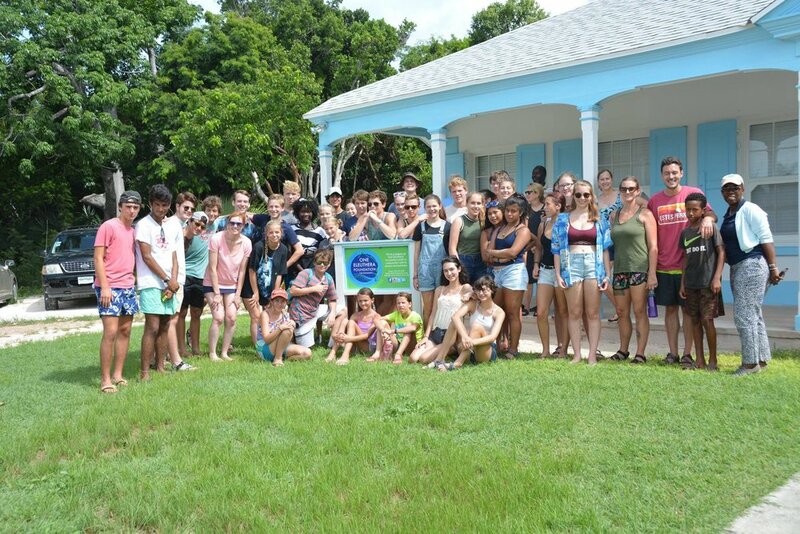 This year, Glenn Youth partnered with Island Journeys, an organization that focuses on creating communities through projects that provide economic, environmental, and sustainable resources to the island. The first two days of mission work, I painted a local high school. The school systems in Eleuthera are highly underfunded and rely on volunteers. While at the school, we met a teacher and the principal who both had been working at the school for many years. Their warmth and welcoming spirit brought an immense amount of joy to the group. The last day of work, I participated at the children’s camp. I was surrounded by children of all different ages. I was reminded of the power of art as the children and I painted and shared about our lives. We laughed, joked, and played games. The word Eleuthera itself means free. Through the process of the trip, I found myself feeling more free from the worries I find at home. I thought about the lessons I learned in the Bahamas that I want to share and incorporate in my life. One of those is the concept of time. As Americans, we are often so tied to our schedules. We are too focused on meeting deadlines and are distracted by phones and social media. With this, we lose a sense of community. When you lose track of time and simply follow “island time” you find yourself free from the stress of daily life and engaging in activities with others. We met and visited with many Bahamian people. We worshiped together and immersed ourselves in their culture. We shared food, laughter, and stories. Bahamians know their neighbors. They wave when they see someone across the street. What would our country look like if we were more like the Bahamian people? If we paused and took the time to find and welcome strangers. As I embark on my new college adventure I will take with me the memories, the lessons, and the friendships that I have built over the course of three trips to the Bahamas. Newer PostShop Till Your Carbon Drops!